Naranjilla is a fruit from Central America. Though it grows in other central American countries e.g. Ecuador and Colombia, but is most abundant in Peru. 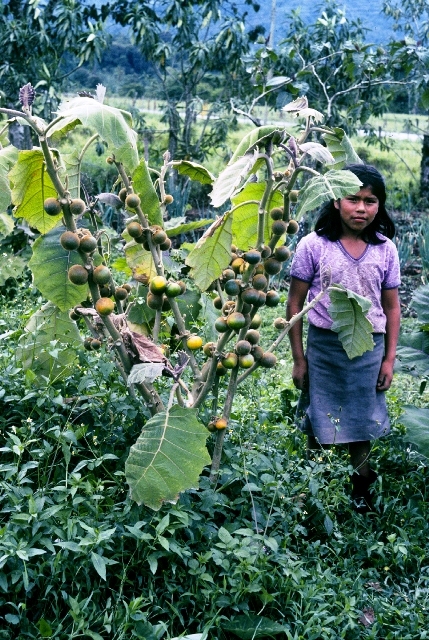 Botanists are of the view that naranjilla most likely originated in Peru. A spreading, herbaceous shrub upto 2.5 m high; stems thick becoming somewhat woody with age; spiny in the wild, spineless in cultivated plants. 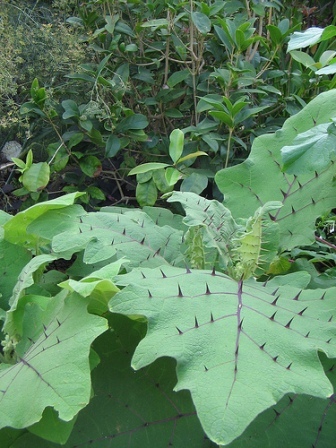 Leaves alternate, are oblong-ovate, upto 60 cm long 45 cm wide, soft and woolly, having few or many spines on petioles, midrib and lateral veins, above and below, or the leaves may be completely spineless; young leaves, young stems and petioles coated with richly purple stellate hairs. 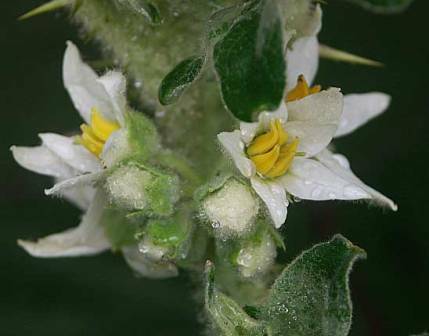 Flowers fragrant, borne in short axillary clusters of as many as 10, the fragrant flowers, about 1 1/5 in (3 cm) wide, have 5 petals, white on the upper surface, purple hairy beneath, and 5 prominent yellow stamens. Fruit crowned with the persistent, 5-pointed calyx, is round or round-ovate, to 2 1/2 in (6.25 cm) across and contains 4 compartments separated by membranous partitions and filled with translucent green or yellowish, very juicy, slightly acid to acid, pulp of delicious flavor which has been likened to pineapple-and-lemon; a brown, hairy coat protects the fruit until it is fully ripe, when the hairs can be easily rubbed off, showing the bright-orange, smooth, leathery, fairly thick peel.. There are numerous pale-buff Seeds pale-buff, thin, flat, hard, 3 mm wide, numerous. Though naranjilla is eaten of hand in large quantities, yet its most popular use is juice. Another popular way of using naranjilla fruits is to cut the fruits into two and squeezing the flesh alongwith seeds. This flesh is then added to ice cream mix, made into sauce for native dishes, or utilized in making pie and various other cooked desserts. The empty shells are then stuffed with a mixture and banana and other ingredients and then baked. A beverage from naranjilla juice by mixing it with corn syrup, sugar, water etc is prepared commercially on a small scale in Columbia. 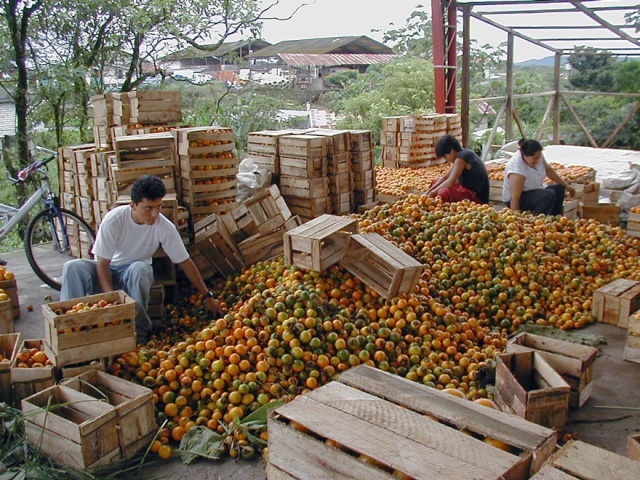 *According to analyses of fresh fruits in Colombia and Ecuador. 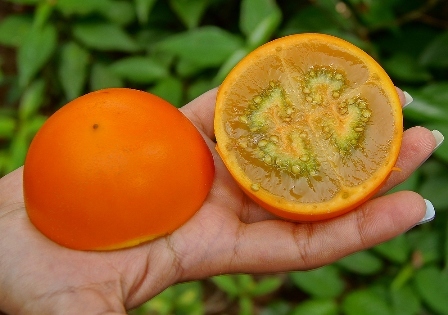 Naranjilla is basically a fruit of warm and humid climate. It grows best in soils rich in organic matter. New plants are mostly raised from feed. These can, however, also be raised by cuttings and air layering. In Florida, narinjilla is vegetatively propagated by cleft grafting on Solanum macranthum seedlings.